This move is significant, as MNCs have a central role in planning for the impacts of climate change. However, if they are not already doing so, business leaders can go a step further by also making their supply chains—often made up of small businesses in developing countries—more resilient. In most of the developed world, large corporations, such as those who pledged at the UN Climate Summit, are the main driver of economic growth and job creation. But that is not the case in most of the developing world, where micro- and small-sized businesses are the economic engines. Ensuring that the whole private sector has the capacity to adapt to climate change can support the resilience of populations everywhere. 1) Small businesses are best suited to reach vulnerable communities in low-income countries. Despite their large financial and operational resources, MNCs do not have the same impact as small businesses in preparing the most vulnerable communities to be more resilient to extreme weather. The populations who will and already are experiencing the worst social and economic effects of climate change are the marginalized and poor populations who live in low-income countries. The World Trade Organization estimates that about 60 percent of all employees in developing countries work in micro and small businesses. In Sub-Saharan Africa, for example, these businesses account for 90 percent of all firms and make up about 25 percent of GDP. Because the majority of vulnerable populations rely on these businesses for their livelihoods, it is vital that they become climate-resilient and are given more priority in climate discussions. 2) If small businesses are resilient, so are communities. 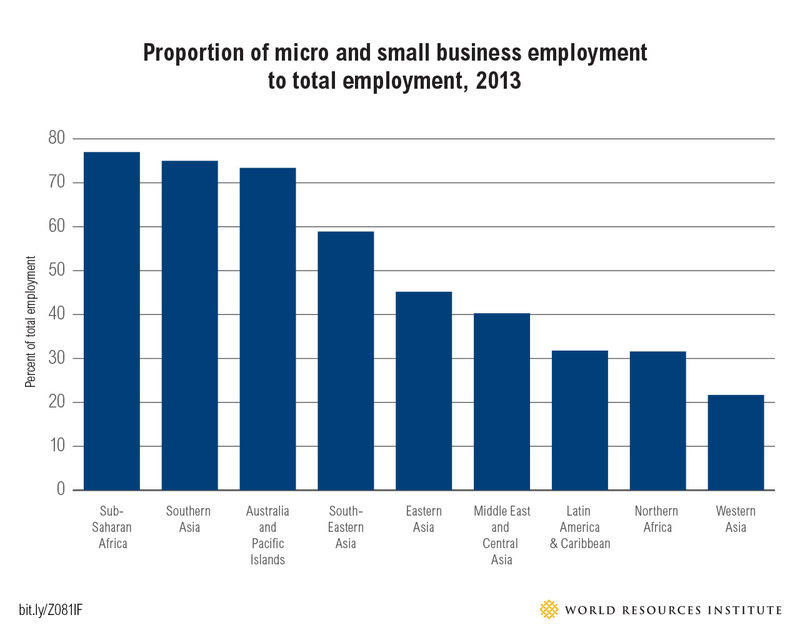 Micro and small businesses are oftentimes the most direct contributors to a stable economy in low-income countries, providing a strong labor force, access to markets, and steady incomes. Climate-proofing the private sector—particularly at the small business level—will not only benefit business-owners, but also employees, households, and others in the extended value chain. For example, in Cambodia, farmers learned new techniques to increase their crop yields while managing scarce resources. By installing irrigation systems and planting new varieties, farmers produced more crops, ensuring food security to the nearby community even when faced with the impacts of climate change. These businesses could also provide resilient goods and services to their communities—such as offering drought-resistant cassava instead of maize or corn, which are sensitive to climate variability—contributing to household adaptation. As such, the private sector would become a valuable ally in building climate-resilient communities and societies from the bottom up. 3) Vulnerable populations have the fewest resources to adapt to climate change. The poor in developing countries are oftentimes highly dependent on the natural environment and have few savings and safety nets to adapt to a changing climate. In Africa, for example, at least 80 percent of the rural poor derive their primary income from employment in small businesses in agriculture, a sector highly susceptible to climate change because of its reliance on natural resources. Without proper risk management and planning, climate impacts like droughts and floods could have long-term impacts on development, creating chronic hunger, displacement, and an uneducated or unhealthy population. Without a strong private sector to support local livelihoods, vulnerable communities are even more exposed to the effects of climate change. MNCs can help in these efforts by strengthening the resilience of their suppliers. However, many more micro- and small businesses not linked to MNCs will also need support. Thus, the public sector becomes an important player in implementing policies and providing financial resources, incentives, and support to help small businesses to adapt to climate change. WRI’s Vulnerability and Adaptation team is currently researching ways that the private sector—including small businesses—can help create climate-resilient communities. Stay tuned for new research on this topic in 2015. LEARN MORE: For more information on the recent UN Climate Summit, check out WRI's LiveBlog.